On Friday, Investor’s Business Daily posted an editorial with the title, “Trump Delivers For Workers … After Years Of Empty Obama Promises.” The editorial cites the latest jobs report and explains how that excellent report is the result of President Trump’s economic policies. The first thing to remember here is that President Trump is a businessman–not a politician (although he has a very fast learning curve). His approach to government seems to be very similar to that of a businessman–what is the most efficient way to solve a problem? There are those in Washington who do not welcome this approach. The 304,000 gain in jobs reported by the Labor Department was nearly twice the consensus estimate. And it comes after December’s expectation-busting gains. There’s more. The jobs picture is so strong right now that it’s pulling people in who’ve been sitting on the sidelines. In fact, for the first time in more than 20 years, the number of people who are out of the labor force — those without jobs and not looking — shrank by 647,000 over the past 12 months. So many people are returning to the labor force that the official unemployment rate is going up, even as the job market booms. This comes, mind you, at a time when baby boomers are retiring en masse. Under Obama, in contrast, the number of labor force dropouts exploded by 14.4 million. The latest numbers also underscore a point we’ve been making in this space for months — that all the talk of a tight labor market overlooked the vast pool of idle workers during the Obama years. Other evidence of this turnaround came earlier in the week, when the Labor Dept reported that private sector wages and salaries climbed 3% last year — the biggest annual increase in a decade. Under Obama, private sector wage gains averaged just 2%. So why now, this late in the game? The answer is simple. At least to those not blinded by partisanship or economic ideology. For eight years, Obama kept promising “bottom-up growth,” while telling the country that tax cuts and deregulation would only benefit the rich. But his policies — Dodd-Frank, ObamaCare, higher taxes, a regulatory tsunami — produced economic stagnation. As it always does, that stagnation hurt the working class most. Trump went in the opposite direction. His pro-growth tax cuts, deregulatory campaign and pro-energy policies fueled huge increases in economic optimism and turbocharged the economy. And now we’re seeing real job growth and strong wage gains for the first time in more than a decade. You tell us which approach is proving more worker friendly. Wouldn’t it be nice if Republicans and Democrats could work together to insure the continuation of this economic growth? Breitbart is reporting today that the Labor Department has stated that initial claims for state unemployment benefits dropped 8,000 to a seasonally adjusted 207,000 for the week ending September 29th. Hurricane Florence, which hit North Carolina and South Carolina last month, affected claims, according to the Labor Department. The largest increases in initial claims for the week ending September 22 was in North Carolina. Claims in South Caroline rose by 2,830, the third largest rise behind Kentucky. Jobless claims, which are a proxy for layoffs, have been closely watched for signs that trade disputes would be a drag on the labor market. Earlier this year, economists predicted that the steel and aluminum tariffs imposed by the Trump administration would cost 400,000 jobs. That prediction now looks way too pessimistic. The jobless claims data has no impact on the monthly employment report, which is scheduled for release on Friday. Bloomberg’s survey of economists sees nonfarm payrolls likely increased by 18o,000 in September after rising 201,000 in August. The unemployment rate is expected to fall one-tenth of a percentage point to 3.8 percent, an 18-year low first hit in May. President Trump may not be the perfect role model for your son, but it is obvious that he is a very savvy businessman who is working for the benefit of all Americans. I hope all Americans will vote next month to elect people who will support his policies. His economic policies are obviously working. The Wall Street Journal posted an article today about how the economy is doing under the Trump administration. The number of Americans filing applications for new unemployment benefits fell to a new 49-year low for the third straight week, though Hurricane Florence’s effect on the jobs market remains unclear. Initial jobless claims, a proxy for layoffs across the U.S., fell by 3,000 to a seasonally adjusted 201,000 in the week ended Sept. 15, the Labor Department said Thursday. It was the lowest level since December 1969, and less than the 210,000 claims economists surveyed by The Wall Street Journal expected. Jobless claims have remained low in recent years, as the labor market continues to tighten and managers face difficulty finding qualified employees. The unemployment rate has been hovering near an 18-year low in recent months. The number of claims workers made for longer than a week declined by 55,000 to 1,645,000 in the week ended Sept. 8. The figure, also known as continuing claims, is reported with a one-week lag. This growth is the result of deregulation, tax cuts, and the energy policy of the Trump administration. This growth will halt abruptly if the Democrats take control of Congress in November as they have already announced plans to reverse the policies put in place by the Trump administration that have resulted in the growth. Bloomberg is reporting today that real disposable income, or earnings adjusted for taxes and inflation, advanced 0.6 percent from the prior month, the biggest gain since April 2015, according to a Commerce Department report Thursday. Part of that I suspect is due to the tax cuts, but there are other things that have made this possible. The data, covering the first month since the tax law was signed in December, reflected a $30 billion increase in one-time bonuses and a $115.5 billion annualized drop in personal taxes, the Commerce Department said. Such boosts to Americans’ wallets, along with a tight labor market, will sustain spending. Those items, plus rising prices, are likely to keep Fed policy makers on track for at least three interest-rate increases this year, including one that’s widely expected later in March. A separate Labor Department report on Thursday showed weekly filings for unemployment benefits fell to the lowest level since 1969. The reduction in taxes helped boost the saving rate to 3.2 percent, the highest since August, from 2.5 percent in December, which was the lowest since 2007. Most Americans pay a higher percentage of their income in taxes than what Medieval serfs paid the lord of the manor to farm their land. The Fed’s preferred price gauge — tied to consumption — rose 0.4 percent in January from the previous month and was up 1.7 percent from a year earlier. Inflation has mostly missed the central bank’s 2 percent target since 2012, though policy makers expect it to rise toward the goal. Excluding food and energy, so-called core prices rose 0.3 percent, matching the median estimate. The core index, which Fed officials see as a better indicator of underlying price pressures, was up 1.5 percent from January 2017, the same annual gain as the prior three months. Adjusted for inflation, personal spending declined 0.1 percent in January from the prior month, the first decrease in a year. The weakness reflected a 1.6 percent slump in outlays for durable goods as auto sales cooled. There are a number of reasons for the improvement of the economy–ending regulations that made it very difficult to start or run a business, putting more money in Americans’ pockets by lowering the individual tax burden, ending the financial penalties that were included in ObamaCare, lowering corporate tax rates to make American more competitive worldwide as a place to locate a business, and simply making it clear that America now welcomes businesses and is prepared to encourage entrepreneurship. Even if you don’t support President Trump, you need to acknowledge that he has been a successful businessman who is attempting to bring that success to America as a whole. Yesterday The New York Post posted an article about the Labor Department‘s December jobs report. I am probably not the only one who wondered why the jobs added number was lower than expected (I see signs of economic recovery all around me–new shops, new construction, formerly unemployed people going back to work, people getting bonuses, etc.). Well, it seems that there was more to the numbers than I thought. But the number was kept artificially low by a seasonal adjustment that wasn’t comparable to the one done a year earlier, in December 2016. And it’s unusual for one December’s adjustment to be so different from the previous December. If the adjustments had been consistent, last Friday’s number would have shown growth of another 133,000. Add the growth that was announced (148,000 jobs) and the seasonal adjustment difference (133,000) and this December’s growth would have been a very, very healthy 281,000 jobs. There was another adjustment that made Friday’s job number look worse than it would have been. In the December figure released last Friday, the government deducted 38,000 jobs that it thinks were lost but can’t prove were lost because they happened inside very small companies. A year earlier, in December 2016, only 17,000 jobs were deducted for this reason. Again, if Labor has simply remained consistent, December’s jobs gains could have been as high as 300,000. As I’ve explained many times before, the government’s economic statistics are not expected to be completely accurate the first time they are announced — even though Wall Street and the media treat them like they are. That’s why the government does numerous revisions. I guess the only numbers we can actually believe are the ones in the final revision! 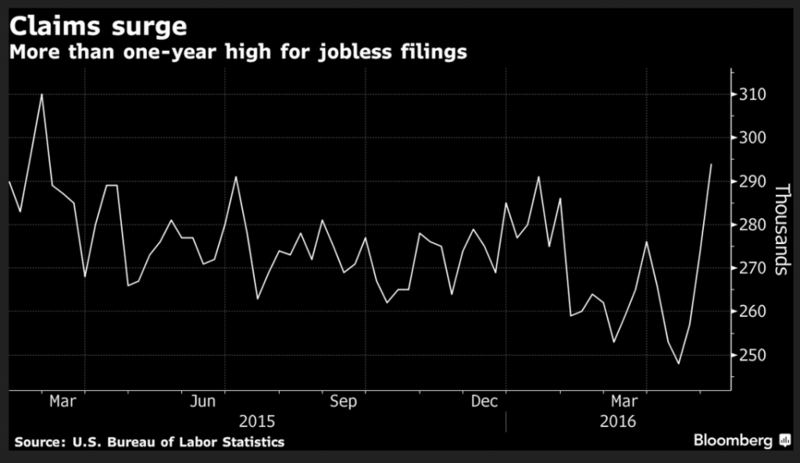 Bloomberg News posted an article today about last week’s jobless numbers. A jump in filings in New York state may reflect striking workers at Verizon Communications Inc., spring break holiday at schools or a combination of the two. Economists will continue to monitor claims data in the coming weeks before concluding that the labor market is taking a bigger step back. A report last week showed that U.S. employers added 160,000 workers to their payrolls in April, the fewest since September and well below economists’ median forecast. Another report from the Labor Department showed import prices rose 0.3 percent for a second month in April, largely reflecting a pickup in petroleum and food. While industrial supply costs increased, prices declined for consumer and capital goods made overseas. I think we need a serious change in economic policies. On September 5, the Weekly Market Wrap at NASDAQ listed the unemployment rate at 6.1 percent. 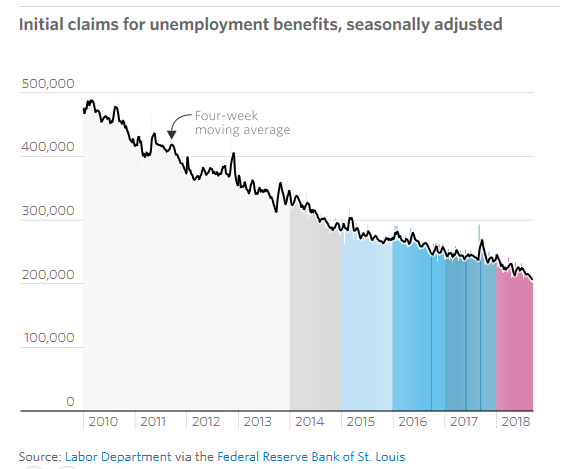 In economic news, in the week ending August 30, the advance figure for seasonally adjusted initial claims (unemployment benefits) was 302,000, an increase of 4,000 from the previous week’s unrevised level of 298,000. The 4-week moving average was 302,750, an increase of 3,000 from the previous week’s unrevised average of 299,750. So we have an increase of unemployment claims, but an unemployment rate holding steady at 6.1 percent. How does the government do that? Easy–shrink the labor force so the percentage stays the same. It came as quite a disappointment last Friday when the Labor Department announced that the U.S. economy created only 142,000 net jobs in August. Even worse, this anemic number came with a downward revision of a combined net 28,000 jobs for the previous two months. Now add to these a third unwelcome piece of news: The U.S. labor force participation rate — that is, the share of working-age Americans who are either working or seeking work — has returned to a multi-decade low of 62.8 percent, down from 65.9 percent before the recession. This number, which has been in a nosedive ever since the 2008 recession began, remains mired at levels that haven’t been seen since women began entering the workforce in large numbers. Fewer Americans are in the labor market today than at any point since 1978. President Obama is not responsible for what happened before he took office, but his policies have resulted in the failure of the economy to rebound from the 2008 recession. I apologize for the length of what is to follow, but every now and then I think it is a good idea to remember how we got here. The recession is not President Obama’s fault; it is not President Bush’s fault; it is not the result of greedy bankers, capitalism, or Wall Street. It is the result of faulty government regulation. The recession was the result of the housing bubble–it’s roots go back to the 1977, when President Jimmy Carter signed into law the Community Reinvestment Act (CRA) passed by Congress. Congress had good intentions–the law was passed to help low-income families buy houses. The idea was to reduce discrimination in housing loans. In 1995 President Clinton modified the law–the idea was to make the paperwork easier to navigate and to make the CRA ratings of banks available to the public. The securitization of CRA loans (including subprime mortgages) began in 1997. In 1999 Senators Chris Dodd and Charles Schumer worked on legislation that allowed the Federal Deposit Insurance Act to allow banks to merge or expand into other types of financial institutions. Under pressure from political action groups, banks began issuing more subprime loans–selling them in groups in investment packages along with loans that had a better chance of being paid back. In October 2000, Fannie Mae announced a pilot plan to purchase $2 billion of “MyCommunityMortgage” loans. The pilot lenders agreed to customize affordable products for low and moderate-income borrowers. There is nothing wrong with the intention here, but it is not a good idea to lend money unless you have a reasonable expectation of getting it back. The increase in loans caused the price of housing to rise faster than the rate of inflation (which is traditionally the rate of the rise of housing costs). Companies began offering ‘interest only’ and ‘variable interest’ loans so that people could make lower payments on larger houses while the value of their houses increased. Banks were forced to issued subprime mortgages or pay large penalties to the government. Fannie Mae prospered because it made more loans and sold them. It’s executives raked in amazing amounts of money. The companies writing the subprime mortgages wrote sweetheart mortgage loans to their friends in Congress. In 2004, 92 percent of the loans issued by Fannie Mae were variable-interest- rate loans; in 2005, 91 percent were variable-interest-rate loans. Fannie Mae guaranteed the mortgages they granted and sold them to banks and investors. Home ownership and home prices continued to rise. Then, in 2004, interest rates began to rise, and gasoline prices climbed. In 2007 the subprime mortgage market collapsed because low-income families could not pay their mortgages. Foreclosures increased. There were no buyers. Home prices began to drop. By September of 2008, twelve banks had failed during that year because of worthless government securities issued by Fannie Mae. So did anyone try to stop this runaway train? Yes. In 2003, President Bush proposed legislation to overhaul the housing finance industry. The President wanted to create a new agency within the Treasury Department to oversee Fannie Mae and Freddie Mac. The Democrats in Congress blocked the legislation, saying it might interfere with the ability of low-income families to buy homes. Barney Frank, a Democrat from Massachusetts, stated, “The more people exaggerate these problems, the more pressure there is on these companies, the less we will see in terms of affordable housing.” Melvin Watt, a Democrat from North Carolina, stated, “…and in the process weakening the bargaining power of poorer families and their ability to get affordable housing.” In 2005, John McCain, a Republican from Arizona, warned of an upcoming mortgage collapse. He sponsored the Housing Enterprise Regulatory Act of 2005 (www.govtrack.us Bill S-190). The purpose of the bill was to regulate Fannie Mae and Freddie Mac. Democrats blocked the bill. The bill was reintroduced in 2007. Again, it was blocked by members of the Senate who had received benefits from the companies involved in the subprime scandal. Senator Chris Dodd, a Democrat from Connecticut, had received a sweetheart loan from one of the companies. Jim Johnson, a key member of the Obama campaign team, also received a sweetheart loan from Countrywide Mortgage. From 1991 through 1998, Jim Johnson was the CEO of Fannie Mae. Johnson received $21 million during his tenure there. The original intent of the CRA was good. It is a wonderful idea to give everyone an opportunity to buy a home. Unfortunately, the expansion of the CRA had the exact opposite effect. Because the government interfered in the free market, a bubble was created. Expectations of what a house should be changed during that time. In the 1960’s and 1970’s there was the concept of a ‘starter home.’ A starter home was usually a relatively inexpensive small house that was affordable, and the equity gained while living there could be used to buy a larger house after a couple started a family. That concept is gone. Look around. What are people building in your neighborhood? The housing bubble reflected a change in what Americans expect in housing. We have lost our moorings for the sake of conspicuous consumption. There is nothing wrong with owning a large home, but we need to balance our wishes with our income; otherwise, America will drown in personal debt as well as federal debt. John Crudele at the New York Post has done a number of stories about fraud in the reporting of the unemployment numbers. He posted a story yesterday about the Congressional investigations into this fraud, including an investigation by the House Oversight Committee and Congress’ Joint Economic Committee. He adds that he is also investigating. He is currently waiting for the Commerce Department to comply with a Freedom of Information Act request he has filed for e-mails and text messages between people in the Philadelphia Census office. At the core of all these investigations is solid evidence that at least one surveyor — a guy named Julius Buckmon, working out of the Philadelphia Census office but polling in Washington, DC — submitted fake household surveys that were used in compiling the Labor Department’s unemployment rate. Because of the scientific nature of the Labor Department survey, Buckmon’s actions alone would have affected the responses of some 500,000 households. But as I’ve been reporting, the scam was allegedly much larger than that and included other surveyors (or enumerators as they are called) over many years. And supervisors at least two levels up are said to have known about — and covered up — the scandal. What the investigators are looking for is that the unemployment numbers were falsified so that they would drop just before the 2012 election. In fact, the unemployment rate did drop before the election. Regardless of whether or not there is fraud involved, our current unemployment numbers are very misleading. Please follow the link above to the New York Post to hear the rest of the story. There is a smoking gun. Unfortunately, the person in charge at the time is claiming that he never saw it. Fox Business reported today that the weekly jobless claims jumped to 368,000 this week. Initial claims for state unemployment benefits surged 68,000 to a seasonally adjusted 368,000, the Labor Department said on Thursday. That was the largest weekly increase since November 2012. Claims for the prior week were revised to show 2,000 more applications received than previously reported. No explanation has been given for the jump. The claims report also showed an increase in the number of people collecting benefits. The number jumped 40,000 to 2.79 million in the week ended Nov. 30. 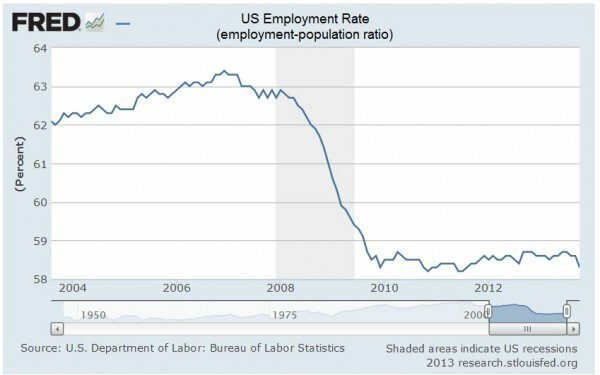 On Sunday I posted an article (rightwinggranny.com) questioning the accuracy of the unemployment numbers we are being given. It is interesting to compare the actual numbers with the numbers being given out during the previous week. John Crudele at the New York Post has posted a few articles raising questions about how the Obama Administration is calculating unemployment numbers. He posted one yesterday. Mr. Crudele has pointed out that unemployment numbers are coming from the Census Bureau and that in 2010 one of its enumerators was caught fabricating interviews. The Census Department surveys that went into the November jobless rate actually took place during the week that included Nov. 5 instead of the normal Nov. 12 week. The Labor Department did put in a note about the survey week change in its November report. John Hinderaker posted a story about the jobs numbers at Power Line today. The chart shows what has happened to the labor participation rate since 2008–it dropped like a rock and stayed there. 1. There are still 1.1 million fewer employed Americans today than right before the recession started, despite a potential labor force that’s 14 million larger. And there are 3.6 million fewer full-time workers than back in 2007. 2. 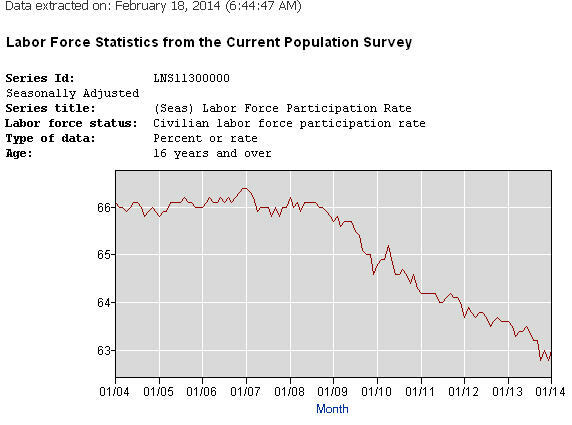 The employment rate, the share of Americans with a job, is 58.6% — exactly where it was in November 2009. 3. If the labor force participation rate were where it was a year ago, the jobless rate would be 7.9%, not 7% (and 11.3% if the LFPR were at prerecession levels, though closer to 9% if demographics-adjusted). Back in the heady days of 2008 and 2009, the Democrats were universally confident that the economy would improve dramatically, as it always does after a recession, regardless of the policies the Democrats followed. All they would need to do was take credit when the time came. The bitter lesson of the last five years is that federal policies do matter. The American economy is diverse and resilient, but if our government’s policies are stupid enough, they can blight the prospects of an entire generation. If you were planning to break out the champagne because of the 7 per cent unemployment rate, you might want to hold off for a little bit. If you want to turn this around, think before you vote. Yesterday CNS News posted a story about $5,159,629,434 in improper unemployment insurance payments for all 50 states, U.S. territories and the District of Columbia for the period July 1, 2011 to June 30, 2012. The data is included in a chart on the Department of Labor (DOL) website. I don’t think fraud is the biggest problem with unemployment insurance. Now that unemployment benefits can be collected for more than a year, how much incentive do people have to look for work during that year? The fraud in the payments needs to be addressed, but so does the length of time benefits can be collected. I understand that the economy is not creating jobs, but does extending the amount of time people can collect money for being unemployed actually help the economy, the unemployment rate, or those people looking for jobs. Yesterday Fox Business posted an article about the jobless claims data reported this week. A sharp drop in the number of weekly jobless claims filed last week was caused by the failure of one large state to report all of its claims, a Labor Department spokesman confirmed to FOX Business. Initial jobless claims, which are a measure of the number of people recently laid off, fell by 30,000 to a seasonally adjusted 339,000, the lowest level in more than four years. But the Labor Department spokesman said the numbers were skewed by one large state that underreported its data. The spokesman declined to identify the state, but economists believe California is the only state large enough to have such a significant impact on the overall numbers. This is the equivalent of saying all of your bills are paid because you are haven’t gotten to the pile of bills you left on the kitchen table. We are truly in the silly season and need to discount at least ninety percent of what we read or hear from the media. Just for the record, the number will be revised upward, but at a time when no one is paying attention. One of the most distressing aspects of the Obama Administration has been the politicization of every area of government. The Department of Justice dropped prosecution of an obvious voter intimidation case, the National Labor Relations Board tried to stop a company from opening a manufacturing facility in a non-union state, and the Department of Justice’s involvement in Fast and Furious is still being uncovered. The latest example of this sort of playing politics with things that should not be political has to do with the impact of the defense cuts the Obama Administration has caused by refusing to engage in serious budget negotiations. Federal law under the WARN (Worker Adjustment and Retraining Notice) Act required employers to give workers a minimum of 60 days notice before potential mass layoffs. Because of sequestration, quite a few people who work for companies related to the defense industry will be getting layoff notices just before the November election. Many of those people live in swing states with electoral votes the President needs to win the election. To avoid the electoral consequences of these cuts, the Department of Labor (DOL) is informing defense contractors that since sequestration hasn’t actually happened yet, and some in Congress are trying to find ways around it, it might be nice if they didn’t obey federal law and send out the pink slips just this once. I don’t want sequestration to take effect, but as of now, it will happen. Therefore, the law should be followed, regardless of electoral consequences. “Sequestration is currently the law of the land, and our nation’s workers have a right to know how these sequestration cuts which begin in January may impact them,” Sen. McCain noted. They deserve to know when they’re about to lose their jobs, and that President Obama did it for them. So do the voters. How’s That Green Jobs Thing Working For You ? Breitbart.com reported yesterday that President Obama’s ‘green jobs‘ initiative has not worked very well. The source of their story was a Reuters story that had been posted on Friday. Since 2009, although the energy capacity of wind farms has almost doubled, the industry has lost 10,000 jobs. During that same time period, the oil and gas industry have created 75,000 jobs. The program’s (the $500 million job-training program that aims to train workers for skills they would need in a new “green economy“) initial results were so poor that the Labor Department‘s inspector general recommended last fall that the agency should return the $327 million that remained unspent. The numbers have improved somewhat since then, but the department remains far short of its goal of placing 80,000 workers into green jobs by 2013. By the end of 2011, some 16,092 participants had found new work in a “green” field, according to the Labor Department – roughly one-fifth of its target. The program also helped employed workers upgrade their skills. At some point are we going to stop wasting taxpayer money on things that don’t work? This is a glaring example of a place where the federal budget could be seriously cut without endangering anyone’s existence.